3 towels provide great performance and value! 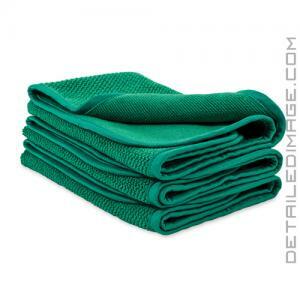 The Griot's Garage Dual-Weave Interior Towels 3 Pack will help you clean various interior surfaces with ease. With all of the microfiber towels on the market, it can be hard to narrow it down to only one towel that you want to use on interior cleanings. The Dual-Weave Interior Towels give you two completely different unique diamond-patterned waffle weave sides that each excel at different cleaning situations. The thick side is super absorbent, so it works well with our interior cleaners, detailers, and dressings. Flip the towel and you have a low-nap weave that excels at light dusting, fingerprint removal, and buffing out interior surfaces. All the dirt, grime, and other contaminations will be safely and easily removed from your dashboard, nav screen, armrests, etc. The towel also features satin edges and radiused corners to ensure safe cleaning, even the most delicate surfaces. If you are looking for a towel that will provide you with two ideal cleaning surfaces, the Griot's Garage Dual-Weave Interior Towels 3 Pack is a great one to add to your microfiber collection! Your first-class interior deserves a first-class towel. These 16"x16" dual-weave towels feature 400 GSM (grams per square meter) microfiber in a unique diamond-patterned waffle weave that effectively lifts and traps contaminants from all interior surfaces. The thick side is super absorbent, so it works well with our interior cleaners, detailers, and dressings. Flip the towel and you have a low-nap weave that excels at light dusting, fingerprint removal, and buffing out interior surfaces. These premium towels feature satin edges and radiused corners to ensure safe, lint-free cleaning and detailing on even the most delicate surfaces.